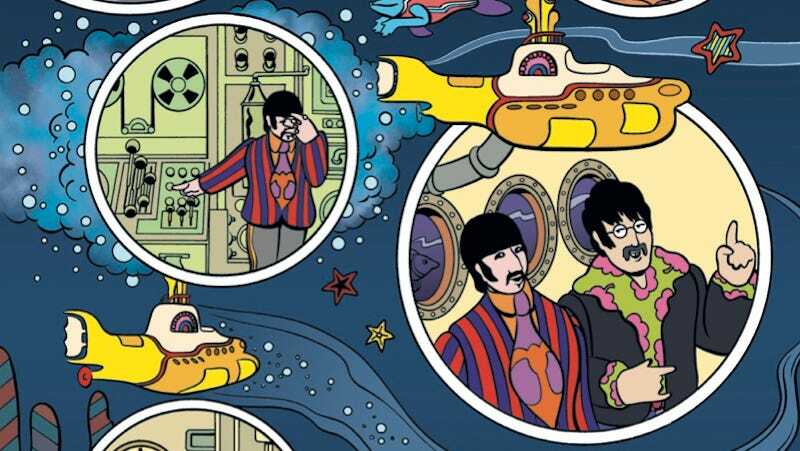 Ringo, George, John, and Paul are returning to Pepperland next year in an all-new comic book adaptation of the the Beatles’ trippy, 1968 animated film Yellow Submarine, courtesy of Titan Comics. Written and illustrated by MAD Magazine editor Bill Morrison, The Beatles: Yellow Submarine—announced in The Hollywood Reporter—will retell the story of the fab four traveling to Pepperland to protect its people from the music-hating Blue Meanies. Though this isn’t the first time the Beatles have been featured in a comic, the new book’s slated to make its way to stores just in time for the original movie’s 50th anniversary, and will join Dark Horse’s The Fifth Beatle as required reading from the Beatles’ comic book canon. Check out the first few pages of The Beatles: Yellow Submarine down below. You can see more from Yellow Submarine, including photos of upcoming collectible vinyl figures, in The Hollywood Reporter.